This evening both youngest son and oldest son and his girlfriend came for dinner. I wanted to make them a nice Sunday night "comfort meal dinner" that everyone could enjoy. 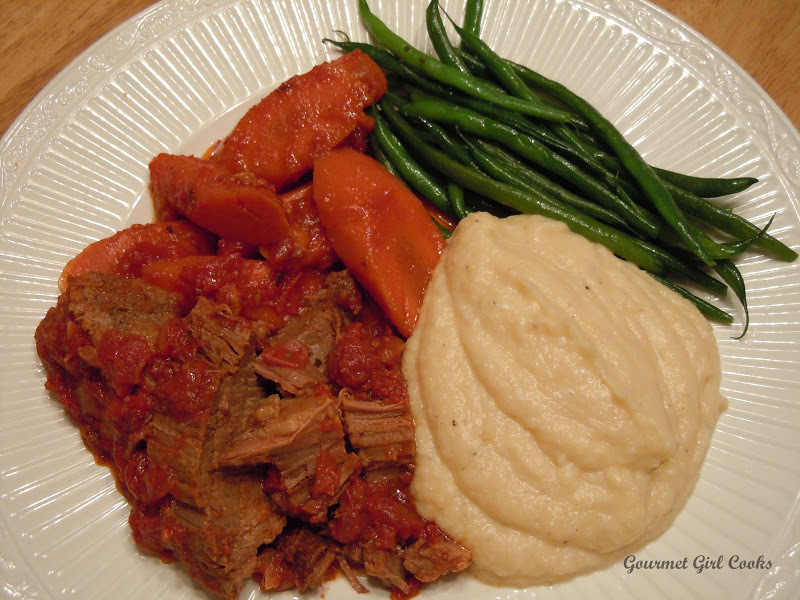 So, I decided to make Braised Beef Brisket and serve it with Cheddar Cauliflower Mash and Fresh Green Beans. I prepared the brisket and put it into the oven early; around 12:30 in the afternoon so it could cook slowly all afternoon. 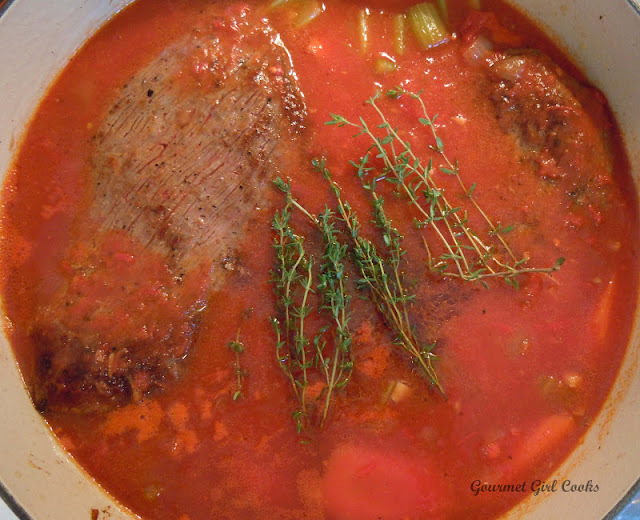 The recipe that I used as a guide for the brisket was one from Gourmet Magazine that I modified a bit. Besides doubling the recipe to make it serve 8 instead of 4, I didn't necessarily double all the ingredients and added some fresh herbs too. Also noted below in the brisket recipe that I revised and actually made was that I found the cooking temperature just too high for braising. Their recipe has you braise it in the oven at 350 F for 3 to 3-1/2 hours. I found it necessary to reduce the temperature to 325 degrees after the first hour and possibly even to 300 F for the remainder of the cooking. In my Le Creuset dutch oven, it was cooking entirely too fast and hard, almost guaranteeing a slab of rubber instead of a tender piece of meat at the end, so I reduced the temperature on mine to 300 F and it turned out perfect and tender. I used to cook my briskets wrapped tightly in heavy duty aluminum foil and covered with cream of mushroom soup topped with thinly sliced onions and lots of black pepper for 3 to 4 hours in a 325 degree oven. I decided to try something different this time. Below are a few pictures of the cooking process as well as the finished product. Enjoy! The sauce ingredients have been added, the brisket returned to the pan and fresh thyme tossed in. Preheat oven to 350° F with rack in the lower third of oven. Heat oil in a wide 6 to 7 quart heavy pot over medium-high heat until it hot. 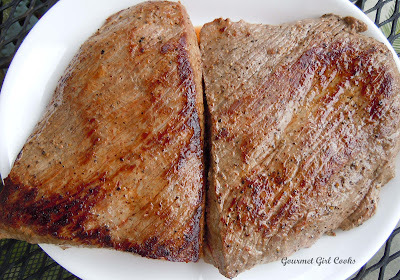 Season both sides of brisket with approximately 1 teaspoon each of salt and pepper (or to taste), then brown brisket, turning once, about 8 to 10 minutes total. Transfer to a plate. Reduce heat to medium. 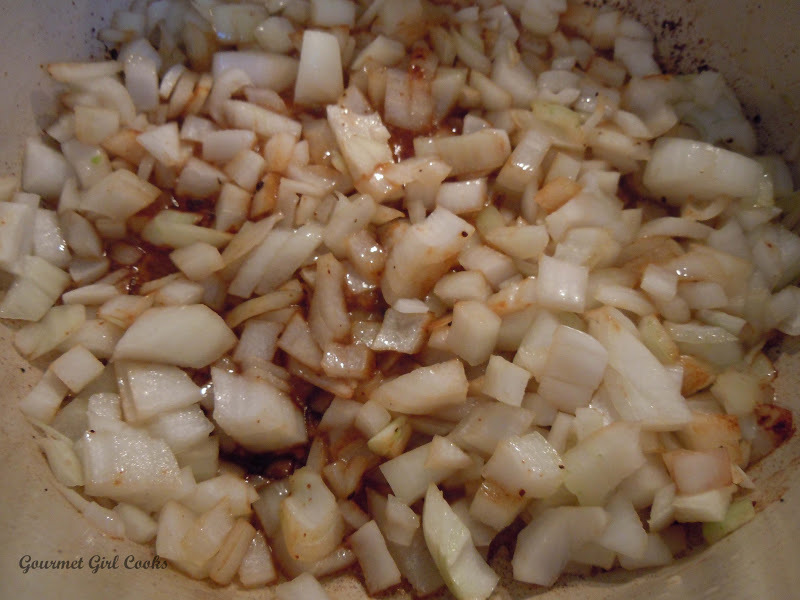 Add onions to pot and cook, stirring occasionally, until golden-brown, 10 to 12 minutes. 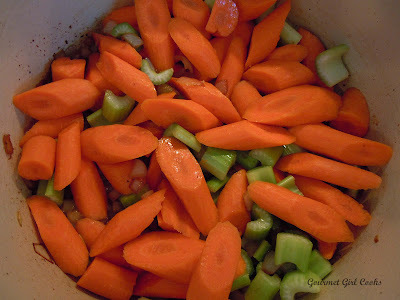 Add carrots, celery, and garlic and cook, stirring occasionally, until golden, 10 to 12 minutes. Add vinegar, stirring and scraping up brown bits. Add stock and crushed tomatoes and bring to a simmer. Return brisket to the pot, nestling it into the braising liquid (liquid will not cover meat). Toss in a few sprigs of fresh thyme (optional). Cover with a tight-fitting lid and braise in oven at 350 degrees for 1 hour; reduce heat to 325 degrees and continue braising an additional 2 to 2-1/2 hours or until fork-tender (see note below: depending on what kind of dutch oven you are using, you may need to reduce the temperature to 300 degrees instead if it is cooking too fast). Total cooking time in the oven is approximately 3 to 3-1/2 hours. Check the brisket about half way through cooking to make sure there is sufficient cooking liquid. If needed, add additional broth or water. Serves approximately 8. Note: Depending on the type of dutch oven you use, you may need to alter the cooking temperature a bit. After the first hour of cooking, when reducing the temperature to 325 F, you may find that you actually need to reduce the temperature down to 300 degrees instead. 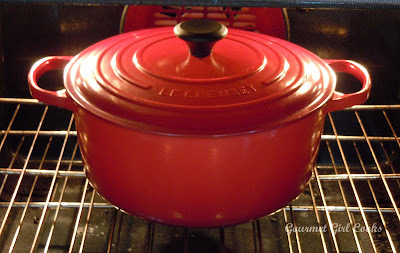 I used a 7-qt Le Creuset round dutch oven -- since it is cast iron and heavy, it retains the heat more efficiently than some dutch ovens and I found that it was bubbling entirely too fast and hard after the first hour, so I reduced my cooking temp to 300 degrees for the remainder of the cooking. Braising is a long, slow cooking method and I found that mine was cooking entirely to hard and fast. To be safe, check your brisket about 20 minutes after reducing the temp to see if you need to lower your temp further to 300 instead. Calzones -- "Let them eat calzones"